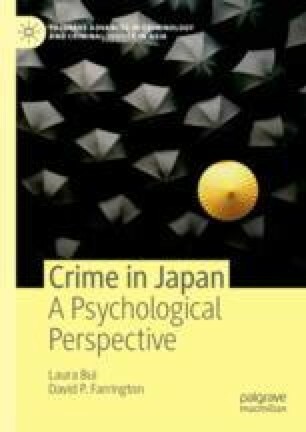 The last chapter reviews the previous explanations for crime in Japan, and based on these, high-quality research is needed to replicate results that previous studies, in and outside of Japan, have produced, and to evaluate the effectiveness of interventions. As the purposes are to replicate and evaluate, a scientific approach would be useful to gain more certainty about the following: what findings are most relevant to Japanese crime and criminal justice; how these findings are connected to the broader social and global context; and what forms of crime prevention are needed and are most effective. Center for East Asia Democratic Studies, National Taiwan University. 2012. “The Asian Barometer Survey” [online]. Available at http://asianbarometer.org/. Accessed 10 December 2018. Northeastern University. 2014. “The International Self-Report Delinquency Study” [online]. Available at https://web.northeastern.edu/isrd/. Accessed 10 December 2018.